Approaching the fall and winter season, distributors and dealers to the institutional, facilities management, hospitality and office furniture markets are reporting an increased demand for umbrella stands and wet umbrella bag stands more than expected. In response, Glaro Inc. has ramped up its stock inventory to prepare for a busy fall and winter season ahead. There is a clear need for umbrella bags. Instead of people walking around and dripping water off of their umbrellas and onto the floor as they walk down halls and create dangerous situations, safety has become a top priority of many building owners. In fact, building visitors often expect to find a wet umbrella bag (either wall mounted or floor standing) so that they can insert their umbrella and proceed safely as they enter. 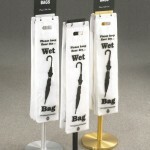 Building maintenance people also favor umbrella bag holders because floors remain cleaner and in better condition longer. In doing so, fewer floor maintenance chemicals are needed and labor is saved, contributing towards a building’s green initiatives. American wet umbrella bag stand manufacturers such as Glaro Inc. are able to ship stock items in three days or less for those building managers who need to take action fast. Distributors who need replacement bags know that like most Glaro Inc. products, wet umbrella bags are available for quick shipping. Glaro’s growing Umbrella Master line also includes traditional umbrella holders for waiting rooms, offices, meeting rooms and entrances. 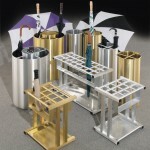 Most umbrella stands and holders accommodate full size as well as tote size umbrellas, and they contain drip pans to capture water that may accumulate. Even coat trees are available with an integrated umbrella holder section for those seeking a combination kit. Remember that all metal products, such as those manufactured by Glaro Incorporated which are made from rust and tarnish proof metals and finishes (aluminum), will also last longer and look better than plastic models, which can crack, break and become flimsy. For more information, visit glaro.com please.